Can’t See the Forest For the Continuity. Science! While never one of my favorite subjects in school, I do remember a few precious scientific facts about our world and the things in it. Trees, for instance. I recall learning that there are basically two types of trees: those that seasonally lose their leaves and those that do not. The seasonal types are called deciduous. The others are called evergreen, because, well, they’re always green. Educational lesson aside, here is where I’m headed with this thing. Comics have more in common with tress than merely the paper they’re printed on. If you think about it, the continuity behind comics falls into the same two categories as the types of trees. And the same can be said about many other forms of mass entertainment. The pros and cons of both types are something I want to examine further. Let’s start with the easier explanation. Evergreen continuity is the basic history of any superhero comic. Each plotline is held as canon for the next. Characters branch off and develop their own roots in the comic universe soil. In the long run, nothing ever changes. But upon closer inspection, it becomes clear that the changes are ongoing. It’s just that they’re ultimately absorbed into the evergreen landscape. You could also refer to this type of continuity as the “Big Picture” view. Everything that has happened affects everything else that will happen. The past shapes the future. Even the event of someone dying is merely a catalyst for their ultimate rebirth. Broadly speaking, this is an attempt to mirror real-life. For example, Spider-Man meets Dr. Octopus. Years later, Dr. Octopus crosses paths with Spidey again and both remind each other (and the audience) that they met previously. Each instance builds upon the last to give depth to the characters and their backstories. And all of this is fine until you get so weighed down with facts and recollections that the characters are more tied to history than they are to any single plot. Even worse is when a supporting character or particular villain appears in another title and gets strange twists added to their history. This affects not only the villain, but everyone else that they have dealt with in the past or will deal with in the future. Evergreen continuity is very linear. Unfortunately, comic books don’t follow a linear path. While most companies establish an overarching universe for their characters, each title operates within its own structured sub-universe. Crossover is encouraged (and inevitable), which further muddles the timeline. The closest thing you could compare this phenomenon to is a soap opera where individual sets of characters have their own storylines. When those storylines reach their natural end, the characters are remixed with each other to provide new lines of interest. That’s how you end up with evil twins and convoluted situations where someone ends up being their own mother. The flip side of this is deciduous continuity. For some reason, this type of history always shows up in humorous situations. I’m thinking of things like South Park, Family Guy and, to a lesser extent, The Simpsons. On these shows, we have a group of main characters that work their way through a half-hour story. Ultimately, the end of the episode has no ill effect on the next episode. Kenny is killed every show and yet somehow magically returns the next week. The supporting characters add color and nuance to the show, but their own backstories are relatively meaningless to the grand scheme of the show. Deciduous continuity is mostly non-linear. Anything can happen to anyone at anytime. Nothing really sticks. The leaves grow, they’re shed and then new leaves grow in their place. Time moves forward, but the isolation of the main characters helps keep the history streamlined to a degree. This type of continuity is based on episodic stories rather than continuous arcs that lead into each other. Most television shows run on a form of deciduous continuity. Shows ranging from MASH to Law & Order to Friends all deal with this type of history. It’s a type of timeline that runs more on characterization than it does action. For instance, think of Richie Rich comic books. Richie Rich is the nice guy. He’s loaded, he’s young and he has a funny dog and a helpful butler. Every issue of every title keeps these facts as a constant. The adventures that Richie Rich goes on add color to these facts, but none of them greatly change the main characters. Once you close the book, everything goes back to the way it was and you wait for the next adventure to be entertained again. So which form of continuity is better? I guess it depends on the type of story you want to tell. But my ultimate argument is that while the name implies that deciduous continuity is always changing, it’s actually not. By shedding whatever history is acquired during a specific story, deciduous continuity brings an air of timelessness to its use. I think it would be more functional to the superhero genre to adopt some of these functions. Look at Iron Man. His origin deals with being a POW in Vietnam. What kind of resonance does that have with kids who were born fifteen years after that conflict? So many villains and heroes sprouted out of World War II or even the tensions of the Cold War. Using a realistic timeline, none of these characters would be functioning at the same level today as they did in their prime. By clinging to an evergreen continuity, superhero comics force themselves to grow up alongside their readers. Marvel and DC both attempt to do this at a ridiculously slowed pace. And, while I’m a bigger fan of Marvel in the long run, I have to say that this type of history stunts the growth of their characters. The DC universe isn’t specific to any reality. It builds its own history and doesn’t recognize real world events. It can offer broad changes at any time, ebbs and flows. Marvel’s strength, in its heyday, was the emotional power it could imbue in its stories by placing its characters in the real world and having them deal with a form of current events. It was radical in its time, but seems rather dated nowadays. When you try to saddle your heroes to the real world, you’re forced to age them. And everyday occasions…weddings, careers, deaths…add further age to each and every character. So is there a path to loosening this evergreen status? Is there a reason to do so? Does any of this make sense or am I just over-thinking the whole thing? What does everyone else think? Whew. I suppose this is a subject we’d have to tackle sooner rather than later, but it’s a mighty complex one. I think that continuity is important, but like everything else in life, needs to be used in moderation. Allow me to clarify my position. I think that deciduous continuity can rely on characterization, as you mention above, but it’s very static characterization. If the events of the past do not affect your character in the future, then your character’s personality doesn’t really ever change. This works well for children’s fare (check out any long running Saturday morning cartoon series, like Scooby-Doo or Bugs Bunny) and for some humor projects like South Park since you want the characters to be eminently recognizable to your viewers, or in the case of South Park you want to be able to do whatever you want to a character in one episode, and not have to worry about fixing it in subsequent episodes. There’s a lot to be said for that, and anything that makes it easy for a new viewer/reader/listener to pick up on the concept of the series on their first exposure to it can only be a good thing. That being said, there’s a limit to the amount that can be done with this sort of continuity and only so many stories that can be told (with the Simpsons trying to make that statement untrue by telling pretty good stories in this type of continuity for two decades now). Evergreen continuity, on the other hand, gives you a lot more opportunity to actually allow your characters to grow as the stories continue. Almost every serialized fiction of any real length has used evergreen continuity to an extent. I think it would be next to impossible to find a pure example of deciduous continuity as even shows like The Simpsons will refer back to previous episodes on occasion. I think the difference between a show like Friends and a comic like Iron Man isn’t the type of continuity to which they adhere, but the degree to which they adhere. I believe you were going in this direction in your initial post, but I believe that, like everything else in life, continuity should be used in moderation. I don’t believe that a writer should come in and ignore everything that has gone before on a title. Those stories happened, and a new writer needs to work with what they are given. Nothing frustrates me more than one a new writer jettisons a previous supporting cast with no explanation, inserts dear old friends that we’ve never seen before (but are now expected to care about) or ignores important events that happened mere weeks ago in the hero’s life. That being said, some stories are just plain bad and trying to explain them so that they fit into continuity is pointless. Let’s use an example…during the mid-90’s, Marvel Comics revealed that Tony Stark had been manipulated by Kang the Conquerer for the past several years. Kang forced Stark to murder people and to fight the Avengers. The Avengers decided that no one could beat Tony Stark except for Tony Stark, and the only possible way to defeat him would be to travel ten years into the past and grab Tony Stark as a teenager and bring the teenage Stark into the future. This they did, and during the battle, the older, Kang-controlled Stark was killed, and Teen Tony took his place as the Iron Man of the Marvel Universe. This met with widespread derision (as well it should) but was quickly undone when teen Tony sacrificed his life to stop Onslaught, was thrust into an alternate universe, and was aged to adulthood once again. When he returned to our universe, his time as teen Tony was not mentioned. Some readers weren’t satisfied with this. “It makes no sense!”, cried they, eager for clarification. “If Teen Tony was aged to adulthood for the alternate universe, he still wouldn’t have the memories of the Tony Stark from the original continuity, so how does the current Stark possess those memories? Explain please!” Thankfully, to the best of my knowledge, Iron Man writers ignored those pleas and never really delved into his past as Teen Tony. This is good. Trying to explain this continuity gaffe would have taken up time and space and would have been helpful only to a small portion of fandom. The series re-aged Teen Tony, which was sufficient. Let your readers come up with their own solutions as to why he has memories that he perhaps should not have. Again, we want to make the stories fun and accessible to new readers. Delving into the deep dark recesses of continuity to explain away obscure plot points is not a good use of a character’s series. Some writers don’t understand that. John Byrne, when he wrote Wonder Woman, spent entirely too much time trying to explain why there was a Wonder Woman in the original Justice Society, when Diana hadn’t been introduced into Man’s World at that time. Way too many writers have spent way too many comics trying to untangle the tortured continuity of Donna Troy. Kurt Busiek, a writer I very much enjoy, used a good portion of Avengers Forever, otherwise an excellent miniseries, untangling plot points from the Avengers. And this is not a new phenomenon. Steve Englehart, during his Celestial Madonna saga in the Avengers, back in the 1970s, did the exact same thing, going on for issue after issue in an attempt to explain discrepancies in character’s histories. I like his run on the Avengers, but those issues still put me to sleep, and I would imagine they would leave new readers scratching their heads in puzzlement. Continuity should be a tool to allow a writer to tell deeper stories and to allow characters to grow and develop. Unfortunately, too many of today’s comics professionals use continuity as a blunt object, and want to craft stories around it, around fixing it or altering it to better serve their visions of what a character’s history should be. Too many of today’s comics professionals are stuck in the past. We need to move into the future, telling new stories. It doesn’t mean you don’t refer to the past. In our Defenders discussion below, you’d refer often to the relationships the team’s roster shared with one another in previous appearances. That deepens their characterizations and makes them more interesting. What you don’t want to do is spend a four issue storyarc explaining how Patsy Walker could have appeared in Avengers #138 with her Hellcat costume, when The Cat #7 clearly states that it was put in storage in Detroit, and none of the members of the Avengers at that time had ever been in Detroit. Continuity. Writers: Take in moderation. What’s the downfall of today’s superhero? Retconning. 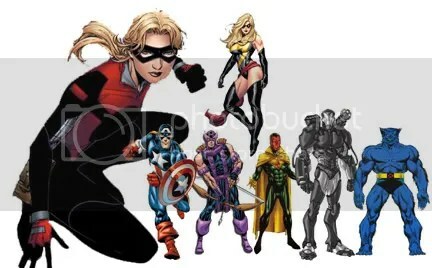 In the Assembled book I’ve been reading, one of the contributors made a comment about Kurt Busiek’s run on the Avengers, saying that “while he was indeed revisiting old-school characters, relationships and situations, he was doing so in the context of the many new developments on those fronts since the olden days, taking assorted old-school concepts in new directions.” Or, to sum it up, he used bits from the past to frame the future. This is the expected use of evergreen continuity. And perhaps I should have written two posts on the subject, because here’s the true crux of the argument. The “retconning” or deliberate changing of established facts is what ruins evergreen continuity. If all writers would simply work with what’s already been shown, then these superhero comics would be much less confusing and convoluted. I’m reminded of Grant Morrison’s run on New X-Men and how the writers that followed him, whether through company mandate or their own failing to understand what to do next, systematically took apart everything that he had built up. Characters that already had bizarre, twisted histories were given another layer of muddle…even characters that Morrison himself had created from nothing. I’m all for continuity. I love it. It gives me something to think about and study. And I wouldn’t mind if every writer used all of the continuity of any given character while they’re writing them. When you’re done with your run, the next guy should come in and just pick up from where you left off. The problem is when certain writers come in (yes, I’m looking at YOU John Byrne) with the belief that their talent supersedes the character itself. They feel that they can create their own version of the character’s history and pay absolutely no attention to what happened before. The creative team that follows them is then left scratching their heads and trying to figure out how to accommodate what just happened with what came before AND with what they want to accomplish themselves. This gives you things like Hawkman, Supergirl and Aquaman (is it just coincidence that this seems to happen more often with DC even though I just praised the company for their non-real world universe?). Of course, then you also have cases where new characters are explained into past history. The first example that comes to mind is Marvel’s Sentry character. Beginning as a hoax on Marvel readers, the Sentry was then integrated into Marvel’s history rather well (though some would argue unnecessarily) by writer Paul Jenkins. Brian Bendis did the same thing with his Jessica Jones creation. This kind of retconning is interesting to me. Here’s a character that blatantly never existed before, yet creators are able to use bits of other characters’ pasts and small vagaries in overall continuity to place their new creation in the fabric of the established universe. It’s a neat kind of phenomenon that can work quite well in building a past for a new character. I think this is another beautiful use of evergreen continuity (and that’ll probably be the only praise you’ll ever hear me heap upon Bendis). It’s of interest to me that deciduous continuity is used primarily in humorous situations. Not sure what’s behind that thinking except that the telling of jokes is more easily accommodated by simple set-ups. If you have too much history piled upon your characters, there are certain ways you expect them to perform and react to things. Plus, the superhero world already has a problem with bringing characters back from the dead…imagine how horrible it would be with South Park rules! Wow. Well said. I think that sums things up nicely: deal with the continuity you have, and stop trying to make it the continuity you want. Perfect. You know, creatively, I’m surprised so many creators have problems with this concept. For example, I always loved the Vision and the Scarlet Witch as a married couple. But they’re not. Were I in a position to handle the characters, rather than trying to say that, I don’t know, the two characters had been replaced by Skrulls before their divorce, and then bringing the married couple back, I’d work with what is currently in continuity. It may not be what I consider ideal, but it’s a very good creative exercise to try and make what you have work in a way you find interesting. Some creators, as you noted, are worse than others on this score. Some creators simply can’t let go of the way they want things to be, and to be fair, neither can some editors. Your example of the way the X-Books dismantled Morrison’s run as soon as he left the book is spot on; I don’t think I’ve ever seen a company back pedal so quickly from a former writer’s work on a book, especially a run that had been so universally praised by critics and fans. Of course, now we have entire event miniseries (like Final Crisis and Secret Invasion) which seem to exist solely to muck with current continuity. I hope that neither of these series make sweeping changes to try and reset the universes to previous settings. I have no problem with surprises and exciting changes, as long as we’re moving things forward and building on what has been done, not knocking down previous structures and invalidating things that are considered inconvenient for the current and future creators.